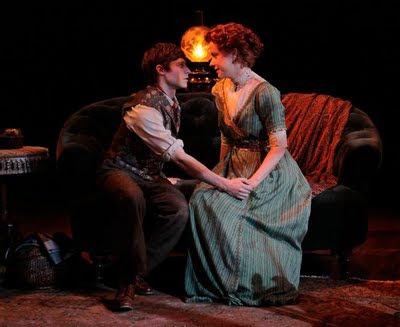 Eugene Marchbanks (Bobby Steggert) with his ladylove, Candida (Kate Fry), in "A Minister's Wife." Photos by Paul Kolnik. 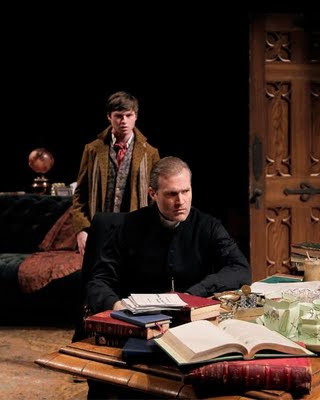 THE love triangle in “A Minister’s Wife,” a musical more or less faithfully adapted from George Bernard Shaw’s “Candida,” is a bit square. It pits a young whelp of a rich romantic poet, Eugene Marchbanks (Bobby Steggert) against Candida’s (Kate Fry) husband, the Rev. James Mavor Morrell (Marc Kudisch). In “A Minister’s Wife,” the easy domesticity in the Morrell household is disrupted by Eugene’s bold puppy love. The musical runs through 12 June in the arena staging of the Mitzi E. Newhouse Theater at Lincoln Center, where it does not seem perfectly at home. It might have been better served in a proscenium presentation. The tension in “A Minister’s Wife” begins when Eugene confronts James about Candida’s love. At first, James is amused by his presumption, then he comes to doubt himself and Candida. (See a video at http://www.lct.org/mediaPlayer.htm?id=86) Graceful and affectionate Candida makes it possible for James, on the frontlines of Socialist thought, to pursue his work and passions. However, there is more ardor in his preaching than in his relationship with his wife. While all the characters in “A Minister’s Wife” are exceptionally well portrayed, BS stands out for the beauty of his voice and the captivating insolence of his performance. 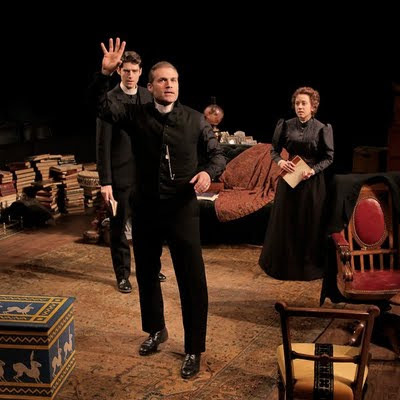 “A Minister’s Wife,” like the play from which it is taken, is a pocket-sized, dainty thing, much unlike the brash and bold musicals audiences have come to expect. The music composed for a quartet playing behind the stage is low-key and understated and the lyrics serve to further and highlight the story. The charm of “A Minister’s Wife” lies in its quiet, dissonance.